Undergraduate students may gain research experience by conducting an independent project under the mentorship of a Biology faculty member, for which they receive course credit (BIOL 480.3 or 481.6). Below is a list of recent projects led by undergraduate students working in the NPEL under the mentorship of Dr. Johnstone and other lab members. In his project, Dominic investigates the impacts of deciduous broadleaf litter on moss growth and associated cyanobacterial nitrogen fixation in mature black spruce and paper birch stands of interior Alaska. Specifically, he will quantify the impacts of leaf litter and leaf leachates on nitrogen fixation occurring on Hylcomium splendens, a common feather moss of the boreal forest that is known to host nitrogen fixing cyanobateria. Moss from a transplant experiment initiated in 2012 has been incubated with a tracer gas (15N2) in 2015 and samples will be analyzed using an Elemental Analyzer coupled to a Continuous-flow Isotope Ratio Mass Spectrometer. The results from this project will enhance the knowledge of the processes that stabilize compositional patterns of boreal forests, which is critical for predicting ecosystem responses to a changing fire regime. Gwendoline focuses on forest succession trajectories in Northern Saskatchewan using data from the woodland caribou project. Specifically, she will look at regeneration rates after fire and tree composition across various landscape. Using tree rings , height measurements and density counts she will provide insights on how forest succession dynamics after fire occur in the Boreal Shield of Northern Saskatchewan. Her work will contribute to the understanding of the boreal forest under the woodland caribou critical habitat assessment plan. Jordyn's 481 project involves describing the patterns of height and radial stem growth of trembling aspen in forests that burned 20 years ago in interior Alaska. Jordyn is using tree rings to assess the difference (if any) of rate of height growth between low and high severity burns. She is also incorporating past moose browsing of each tree into the analysis to determine if there is an interaction between fire severity and browsing on stem growth. The results of this analysis will provide information on moose habitat availability in post-fire forests. Jordyn was also a field assistant for the Caribou Project during the summer (2014). Nicholas has been looking at patterns of black spruce productivity in mixed forest stands in Alaska for his BIOL 480 project. His research uses tree rings to assess if there are productivity and growth rate differences between black spruce (Picea mariana) trees based on its co-dominance with two different deciduous species: paper birch (Betula neoalaskana) and trembling aspen (Populus tremuloides). Nicholas was involved in collecting the samples for his research in Alaska while he was working as a summer student through the NSERC USRA program. Nathan's BIOL 481 research focused on evaluating the precision and repeatability of different methods of monitoring tundra plant communities. He collected field data at the Wolf Creek site in Yukon Territory as a NSERC USRA student and compared estimates of species abundance obtained using one of four methods: presence/absence, visual cover, point intercept sampling, and aboveground biomass harvest. The results from the project will be useful in deciding what methods are most appropriate for long-term monitoring projects with different research objectives. Sarah analyzed tree rings sampled from jack pine growing near the southern edge of the boreal forest in central Saskatchewan. Trees were sampled from 5 sites positioned along a gradient in ground-water depth. Sarah assessed patterns of ring width variation to see if there were differences in the tree growth relationships with climate depending on whether trees have continuous, sporadic, or infrequent access to groundwater as a source of moisture. Results will help to identifiy the conditions under which trees are able to tap into ground water sources, and how access to groundwater affects the sensitivity of tree growth to annual variations in climate. Scott examined tree-rings collected from black spruce in Alaska to assess how the signal of tree growth responses to climate varies depending on what part of the tree is sampled. He compared ring width series obtained from breast height samples with basal samples collected just above the root collar of black spruce trees. His research will help to determine whether basal tree samples, which are ideal for determining tree ages, can also be successfully used to look at climate-growth relationships, and whether there is a unique growth signal found in this portion of a black spruce stem. Leanne's research examined patterns of plant productivity among three closely related species of willow and an evergreen shrub outgroup to assess whether species can be reasonably pooled into a single growth form type to simplify the characterization of plant productivity in ecological models. 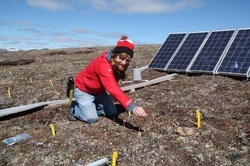 Leanne collected samples of current-year stems and leaves of focal shrub species across natural gradients in soil temperature and plant productivity at Wolf Creek, Yukon. She compared variation in plant productivity between individuals and sites within a species, and between species (within a genus or including the outgroup) to assess the level at which there is the highest correlation in plant productivity patterns.